Flourless Chocolate Cake with Chocolate Glaze | FoodGaZm.. This moist and dense chocolate cake is topped with a smooth, rich dark chocolate ganache that melts in your mouth. Serve it with sweetened whipped cream and raspberries for a delightful and elegant desert. Preheat oven to 350 ˚F. Line a 10-inch spring-form pan with parchment paper and set aside. In a heavy-bottomed saucepan, combine sugar and water over low heat. Stir until sugar has melted, simmer for 5 minutes, then remove from heat. Melt butter in a saucepan over medium-low heat, add chocolate and stir until smooth; then add in sugar mixture. Let mixture cool slightly, add in eggs and whisk until well blended. Pour batter into prepared spring-form pan. Set spring-form pan inside a roasting pan and then add enough hot water to the roasting pan to reach halfway up the sides of the cake pan. Put the roasting pan in the oven and bake for about 50 minutes or until cake no longer moves in the center when lightly shaken. Remove the spring-from pan from the water bath and transfer it to a rack to allow the cake to cool completely. Bring the cream to a simmer over medium-high heat. As soon as cream begins to simmer, remove the pan from the heat, stir in chocolate and whisk until smooth. 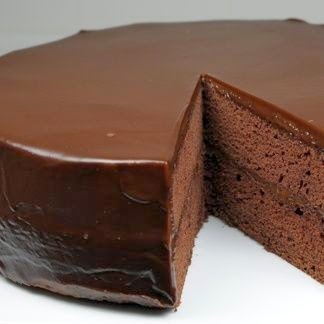 Pour ganache over the top of the cooled cake, gently rotating and turning the cake pan to distribute it evenly. Refrigerate the cake for about two 2 hours. This can be made two days ahead and stored in the refrigerator.